We wanted to explore this idea of hiking long-distance trails that connect conservation areas while crossing sections of New Zealand’s Te Araroa. The Te Araroa, or “the long pathway” in Maori, is a 3000km trail that passes from the northern tip of New Zealand’s North Island to the southern tip of the South Island. Rugged mountains, roaring rivers, temperate rainforests, windy grasslands and sandy coastlines are examples of the terrain one should expect to cross when hiking the Te Araroa, as well as a variety of villages and communities. The idea of hiking a long-distance trail, which in the not-too-distant past might have seemed extreme to most of us, is rapidly gaining popularity. For some, completing a long route on foot has become a goal in life. Others are looking for an escape from their techno-centric lives and see long-distance hiking as a way to cleanse their bodies, knowing that the length and challenge of such a trip is almost guaranteed to be good for the muscles and mind. Some people aim to cover significant mileage each day, whereas others seek out the hiking community that inevitably forms on each trail. Each person arrives with his or her own reasons to hike for several months and push the body to see how far one's feet can take them. And why not? Beautiful landscapes in far-off corners of the world can sometimes only be witnessed when you arrive there on your own two legs. And while the views will undoubtedly be impressive and the community of trampers you meet along the way unforgettable - one area that could use more attention when exploring the idea of long-distance hiking is that: any route that traverses hundreds or thousands of miles will almost inevitably cross several areas important for conservation. Along the way, you’re going to see some biodiversity. You’re going to pass through a number of ecosystems and habitats, many of which will benefit from your awareness and education. And by taking a little time to learn more about the wild places through which you'll pass, your experience can be enriched and more fulfilling. Trails around the world are seeing increases year over year for numbers of thru-hikers. Taking the Appalachian Trail as an example, just 59 hikers registered completing two thousand miles of the trail from 1930-1969. In the 2010s alone, over 7,500 people have registered as having completed 2000 miles of the trail. The growing demand of people wanting to hike long-distance trails goes hand-in-hand with new trails being developed around the world. In the United States, many people have already heard of the Appalachian Trail, the Pacific Crest Trail, and the Continental Divide Trail - the three of which are now known as the “Triple Crown of Hiking” - but other long distance trails are also being built in the US, such as the North Country Trail which will cross 4,600 miles of the northern states from North Dakota to New York. Head south to Chile and they have their own long-distance trail that’s beginning to receive some attention, the Greater Patagonia Trail. In Japan they have the Tōkai Nature Trail which spans 1,050 miles and connects two national parks; in Europe there’s the Via Alpina, a network of five long-distance trails in the Alps that traverse over 3,100 miles in Austria, France, Germany, Italy, Liechtenstein, Monaco, Slovenia and Switzerland. Aside from Antarctica, all continents have or are developing their own designated long distance trails, and simple searches on the internet can provide information for a variety of long-distance footpaths for many countries. Nelson Lakes National Park offers impressive views of mountains, distant and close, as one crosses the national park along the Te Araroa. We wanted to explore this idea of hiking long-distance trails that connect conservation areas while crossing sections of New Zealand’s Te Araroa. The Te Araroa, or “the long pathway” in Maori, is a 3000km trail that passes from the northern tip of New Zealand’s North Island to the southern tip of the South Island. Rugged mountains, roaring rivers, temperate rainforests, windy grasslands and sandy coastlines are examples of the terrain one should expect to cross when hiking the Te Araroa, as well as a variety of villages and communities. This is one of the characteristic features of New Zealand’s long trail: its diversity of landscapes. But when hiking thousands of kilometers across any country, you’re going to encounter a breadth of various ecosystems. This is the only alpine parrot in the world, a very intelligent and curious bird species. Their numbers dropped from 150,000 to 5,000 in the 20th century when the New Zealand government used to pay bounties for hunters to kill kea, due to concerns that the birds kill sheep. Now, since 1986, they have been strictly protected under New Zealand's Wildlife Act. In terms of biodiversity, New Zealand offers a chance to see species that you cannot see anywhere else. When high up in New Zealand’s mountains, you might come across the world’s only alpine parrot: the kea. This highly intelligent bird is somewhat notorious for tearing open bags, tents and sometimes cars - but their inquisitive and unabashed curiosity also provides hikers with an opportunity to see their beauty up close. If you’re hiking along the beaches, you might see Hector’s dolphins surfing the waves. The tiny endemic dolphins are only about a meter and a half long, though they are not short on playful antics while fishing and surfing. Hector's dolphin (Cephalorhynchus hectori) is the smallest dolphin species in the world and the only cetacean endemic to New Zealand. 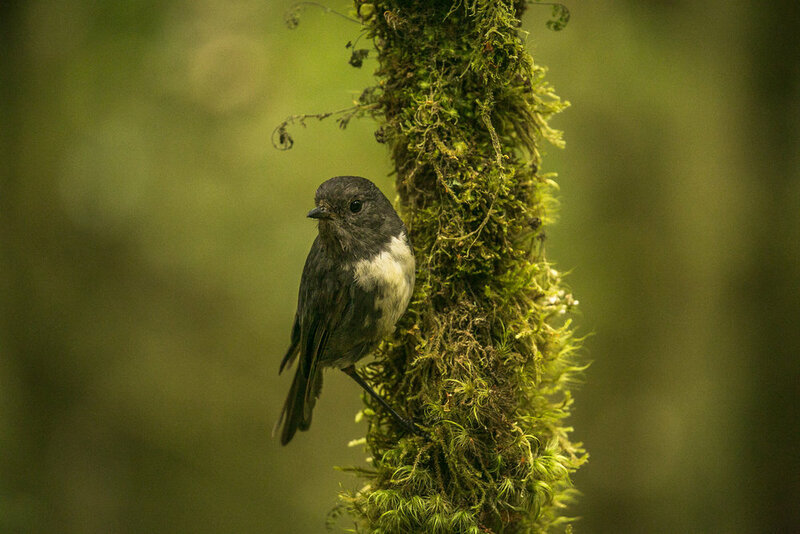 Throughout the forest, fantails and South Island robins continually fly from branch to branch to check up on your progress, often eye-level right in front of you and sometimes even landing on your hiking pole or boot. Wekas waddle into camp from the bushes, cicadas keep a steady buzz while passing through the forests of the Queen Charlotte Track, and the incessant sand flies never fail to keep you moving if the wind isn’t blowing - which we forced ourselves to appreciate because of the benefits they provide to many other species. The South Island robin is a small bird that hikers will see often along the Te Araroa. Their numbers have declined due to habitat loss, and therefore they are now protected. They are an endemic species of bird to New Zealand, and are sure to cheer up any weary hiker with their fearless curiosity. If you’re trying to hike 30 miles or more a day, you might not give yourself the opportunity to stop and observe the nature around you, but for some, hiking long-distance offers the chance to observe the biodiversity and wildlands of several national parks and conservation areas of a given region. This should be higher up on the list of reasons why we hike long-distance trails. On New Zealand’s South Island alone, the Te Araroa passes through 18 protected areas, including 2 national parks, 2 scenic reserves, and 13 conservation areas, further described in the text box below. It is true that much of New Zealand’s bird life and biodiversity has been markedly harmed by human-introduced species such as the stoat and the brown rat. When walking the trail and seeing how much work goes into controlling invasive species - signs, traps, markers, and their maintenance - it becomes obvious that we are still learning a powerful lesson. The lesson is that, in so many cases, we fail to comprehend the complexity of biological systems despite causing significant impacts to them, intentionally or unintentionally. New Zealand's Protected Areas are managed under six laws in the country: Conservation Act 1987, National Parks Act 1980, Reserves Act 1977, Wildlife Act 1953, Marine Reserves Act 1971, and Marine Mammals Protection Act 1979. National Parks: Areas set aside for their "intrinsic worth and for the benefit, use, and enjoyment of the public, areas of New Zealand that contain scenery of such distinctive quality, ecological systems, or natural features so beautiful, unique, or scientifically important that their preservation is in the national interest". Conservation Parks: Large areas designated to protect their natural and historic resources, and to facilitate public recreation. Includes "Forest Parks". Scenic Reserves: Areas of native vegetation set aside due to community interest. They are usually smaller in size compared to NZ's Conservation Parks and National Parks. A downloadable version of the map to the right is available here. The areas in blue are the parts of the trail we hiked in January 2018. Conservation Atlas has recently become a member of the Nature Needs Half (NNH) network. NNH is an organization working to help communities, governments, corporations and individuals understand that it is important for the health of the planet to conserve approximately half of its surface, both land and sea, if we want to have a chance of keeping biological systems intact. From the microbes in our soil, to the fungi, beetles, birds, worms, lizards, fish, corals, and all other species - every one of which plays a role in its respective habitat - we are surrounded by biological systems that interact in ways that we are only beginning to understand. We see that long-distance trails are one way of connecting travelers with various areas encompassing chunks of the planet’s “wildscapes”. There really aren’t better ways, that we can think of at least, of forming a connection to so many different protected areas over such a relatively short period of time. By hiking for a long duration, we have the option to slow down if we so choose and explore the new land at our own pace. With food and shelter strapped to our backs and not a road or human sound in sight, we have the freedom to stop, look around at the grass in some valley surrounded by forested snow-capped mountains, let our hearts slow and our ears adjust to hear the soft splashing sound of a nearby stream and birds call from along the walls of trees on each side, and fully appreciate the wild places that this planet has to offer. And hopefully we can do this knowing that we are standing in a place that was given the grace of being protected. We see that long-distance trails are one way of connecting travelers with various areas encompassing chunks of the planet’s “wildscapes”. There really aren’t better ways, that we can think of at least, of forming a connection to so many different protected areas over such a relatively short period of time. By hiking for a long duration, we have the option to slow down if we so choose and explore the new land at our own pace. With food and shelter strapped to our backs and not a road or human sound in sight, we have the freedom to stop, look around at the grass in some valley surrounded by forested snow-capped mountains, let our hearts slow and our ears adjust to hear the soft splashing sound of a nearby stream and birds call from along the walls of trees on each side, and fully appreciate the wild places that this planet has to offer. And hopefully we can do this knowing that we are standing in a place that was given the grace of being protected. For our photo essay regarding the Te Araroa, please see the link here. Conservation Atlas is also in process of producing a short film about the Te Araroa, with footage of the landscapes, wildlife, and several interviews with fellow trampers. Please check back with us soon, or sign up for our email updates, to learn more about the soon-to-be-released film. Soft evening sunlight settling on New Zealand's rugged mountains on the South Island. We appreciate our privacy, so we will always respect yours. We will use the data collected here only to keep in touch and let you know about our activity.